Has this question every surfaced for you? Just as each calendar year has its seasons, which consist of various types of weather, so too do the seasons of life. Regardless of economic or social status, each of us is guaranteed to have a season (or seasons) of struggle and hardship. A season that may seem unfair or unjust, forcing us to ask the question I posed above. If you’re in the middle of one of these seasons, I invite you to change the way you’re seeing your circumstances. In the midst of hardship and struggle, our default response is often to give our power away. In other words, we act as if we have absolutely no control in the situation. This is only partially true. While we certainly can’t control the circumstance, we will always possess the power to control our thoughts (or perception) about the circumstance. This is the power of a lens change, or mindset change. Let’s go back to the question I posed above. Can you see that it’s powerless in that all of the power is placed in the circumstances, or bad things? What would happen if we changed this question to one of curiosity? It might sound like this – “Could these things be happening for me?” Now, instead of waving the white flag and surrendering to the power of the circumstances, we step firmly into the mental battlefield and take our power back. Let me give you an example of someone who exemplifies this principle. Perhaps you’ve heard the name Anthony Robles. 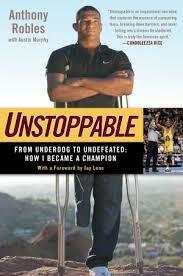 One of the most decorated wrestlers in Arizona State history, Robles was born with only one leg. One might say that he was born into a season of struggle and hardship. His wrestling journey began at a young age, often characterized by setbacks in the form of losses on the mat. Over time, he came to realize that his disability could actually serve as a tremendous source of unique abilities. For example, because of his low center of gravity, it was much easier for him to defend against an attack from an opposing wrestler. He was also able to harness his incredible upper body strength to create several unique offensive moves, one of which had never been seen before in the world of wrestling. Now that his wrestling career is over, he continues to use his circumstance to empower others. When you hear him speak, it’s clear that he doesn’t give an ounce of power to the fact that he only has one leg. Instead, he speaks from a space of complete confidence that his physical condition didn’t happen to him, it happened for him. In fact, had he surrendered to the powerless nature of the question I posed at the beginning of this article, we perhaps wouldn’t even know who Anthony Robles is. Simply put, his journey began with an “anything is possible” mindset and it continues to fuel him today. I invite you to watch the following video, which will give you a much more intimate look into Anthony’s life. Click here to watch. P.S. If you’re in the Phoenix area and would like to hear Anthony share his powerful story, I have a unique, once-in-a-lifetime opportunity for you. He will be speaking on Monday, October 5 at 7:30 in Ahwatukee. Please email me at mike@kaleidoeye.com if you’re interested in registering.